The Dunu DN-2002 has a lot to live up to, we reviewed the original DN-2000 earphone back in 2014 and it left us massively impressed. Soon after Dunu released a slightly tweaked version, the DN-2000j which hit the market soon after and gained quite a following amongst audio enthusiasts around the world. As with all Dunu's products there is a running theme that you will get a whole lot of performance for very little (relative) damage to your wallet. They consistently impress us at their respective price points and also with their forward thinking development of new models and designs. What made the original DN-2000 such a hit was that they were the first one company to really nail hybrid technology in in-car headphones. The sound quality was excellent with a big soundstage, lots of separation, detail and was tuned with just a hint of warmth that made them extremely engaging to listen to. People have been eagerly awaiting Dunu's next venture and after months of teasing the Dunu DN-2002 is now available to buy. Design wise these new hybrid IEM's look to be a fundamentally different approach. Gone is the cable down housing in favor of an over the ear option and in comes detachable cables as opposed to fixed. Dunu Topsound is masters of the packaging and accessories section in our previous reviews. Their previous earphone offerings have never failed to impress and with the DN-2002 they again go above and beyond what other headphone manufacturers include with their headsets. The Packaging is simply done with high-quality cardboard boxes and tasteful graphics and sleeves. There is plenty of information on the outside that allows users browsing in a store to see the spec and contents of the IEM's inside. It's not ultra premium presentation stuff but it still feels like a classy effort and it is very little I would change. The fun starts with Dunu when u actually crack open the headphones and begin to wade through the seemingly endless accessory options that they include. Just like on previous reviews we find yourself smiling at the sheer number of options we have to customize the fit of the headphones to our liking. There are a few standout pieces here. I really like the hard case its absolutely rock solid. With most of my expensive earphones, I buy a separate Pelican 1010 case to house them in. This is in my mind the absolute best way to store your IEM's when not in use but the Dunu case comes pretty darn close. Its rubberized on the inside and seems to have an excellent seal around the lips to keep water out. The other is the choice to include spin it tips. Spinfit is hot stuff right now in the portable audio world. these tips pivot (spin) to find a more natural position in your ear canal and thus can result in a better fit and consequently better sound quality. I have converted a few months ago but Dunu is the first company that I have seen to include them as standard. Considering that a single pack of these tips alone cost $10 it's a very welcome addition to using with the DN-2002. 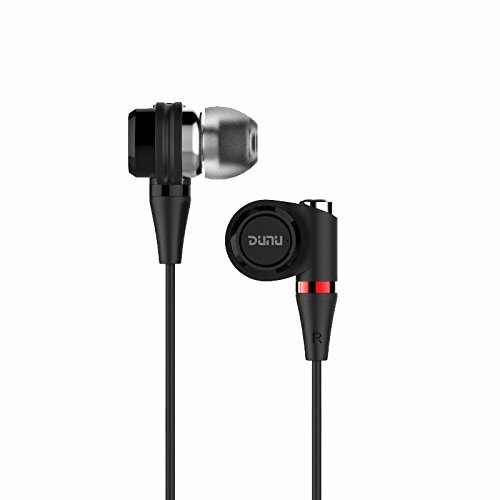 The build quality of the Dunu DN-2002 is, as was expected, exceptional. Like most other high-end Dunu earphones they feel like tanks which will be able to withstand years upon years of punishment. There are a lot of high-quality materials in use here. The earbuds housings are barrels like in design with an all-metal body, protruding metal tips, and even a metal mesh grate on the outside to prevent ingress of dirt and dust into the drivers. They are very well constructed. Instead of leaving the barrels with the wires entering the housing the directly Dunu has done things a little different this time. The have instead created a loop that the detachable cables enter through and as a result, transforms the DN-2002 into a more traditional stage monitor style IEM. The effects of this are twofold. Firstly on the positive side, it has allowed Dunu to reduce the actual item housing size. Secondly, it has meant that people with small ears could find issue with comfort due to the new cable attachment system. As many readers here will know I consider myself as having decidedly average sized ears. The 2002 fit me like a glove, I find them extremely comfortable when using them with the red spinfit tips and man do the stay in place well. That said I can definitely see where the issue would arise if my ears were just a tad bit smaller. I was supplied 2 cables with the review unit of the DN-2002 and can say that both are excellent. The stock cable is lovely. It's thick, tangle-resistant and microphonics are non-existent (not that you should wear these earphones with the cable down but it's worth mentioning nonetheless). There is a solid metal Dunu branded cable splitter down the middle and a buttery smooth slider. The Jack is the right angle and small enough to fit into most headphone ports on phone cases. At the business end of things, the detachable cable system Dunu has used is the MMCX standard but the have put a small notch on the connector housing to stop the cable from spinning freely. Unfortunately, this means that without a bit of tinkering you will have little luck in getting non-Dunu branded 3rd party cables to fit the DN-2002. You might have noticed in some of the photos I am not using the stock cable which came with the DN-2002 instead I have on Dunu's own aftermarket cable. Of course, I don't buy into the BS people spew about cables increasing sound quality but that doesn't mean there aren't benefits to aftermarket cables. I personally think that the stock cable of the DN2002 is a brilliant cable but there's no doubt that this aftermarket cable takes the earphones up a notch in terms of build and wow factor. It is a braided copper/silver affair with the same slider as before but it also comes with a meaty metal right angle connector. At the top end you also get different connectors to the original cable, they are shorter and length and thus reduce the size of the IEM's by a few mm inside the ear so this could be a possible solution to users who have issues with fit. Is it going to be necessary to buy this cable? No. Does it add to the build quality and make them look even cooler? Absolutely. A nice option for those of us who like to tinkers and modify our earbuds. Now here is the best bit the new DN-2002 for all intents and purposes sounds like an even more refined DN-2000. That's a very good thing indeed. Staying true with the sound signature from these new earphones are smooth, detailed and spacious sounding. The top end surprisingly manages to push out a bit more detail than the outgoing model still it is in no way a treble happy IEM. It remains far smoother than many other manufacturers competing in the premium earbud space tend to tune their offerings. Perhaps this is why I love the DN range so much as they have always been great all rounders that make all day listening, a pleasure. In the course of this review, I have well over a month of listening with the 2002 with every genre possible and never once have I suffered from treble fatigue or ever thought about EQing down the treble. Naturally, this works great with the vast majority of modern genres but it also means that it won't rip apart poorly mastered tracks and performs well even with sub-optimal sources. Again smooth and presented with lots of detail. You certainly don't feel like anything isn't there as the clarity of the IEM allows you to pick up even the most nuanced sounds. Natural is probably the best way to describe the DN-2002's midrange. Guitars and stringed instruments display this most and sound very close to real life. There is no over emphasis on the upper midrange that when paired with that relaxed treble further emphasizes the ability of the earphone to be a relaxing listen. That said those who like a super accurate analytical sound will be turned off by the slight addition of warmth to the midrange. For me, this, of course, is a plus point. The longer I have been reviewing earphones the less I appreciate the coldness of earphones like the Etymotic ER4. It's also not as lush as the Campfire Audio Lyra though, perhaps being tuned more to the likes of the Shure SE415 but with a touch more air about its presentation. Lows are very good and it is where the hybrid earphone design comes to show its strength. You get a good amount of weight to the low end and little in the way of bleed into the midrange. A slight midbass hump can be observed making these earphones a perfect match for the high-tempo electronic music. In fact, the speed was surprisingly fast, much faster and tighter than the DN2000 was. Not being quite as large its predecessor the 2002 still displays larger than average amounts of depth and width. Probably on equal levels. You aren't going to have an out of the head experience but for modern genres and even most rock this works quite well. There is plenty of room for the instruments and vocals retain adequate spacing and plenty of contrast between different tones. I was actually impressed by how versatile the earphones were in our tesing. The seemed to play well with every genre I threw at them only coming slightly unhinged with jazz and some classical due to its laid back top end. Cables are MMCX standard but with proprietary notch to stop rotation. Laid back highs will leave Jazz fans lacking. They are built to last and issues with fit on our smaller eared brethren aside there is little reason I can see to not recommend the DN-2002. Another incredible earphone from one of the trailblazers in the portable audiophile space.